Following the success achieved by the First Aid Courses delivered in 2014 as part of the MCVS Training Programme which has been running since 2012, the Malta Council for the Voluntary Sector is launching these courses once more for 2015. The Malta Council for the Voluntary Sector is organising three First Aid Courses in collaboration with the Malta Red Cross Society, the St. John Ambulance Brigade, Malta and the Emergency Rescue and Response Corps, Gozo. 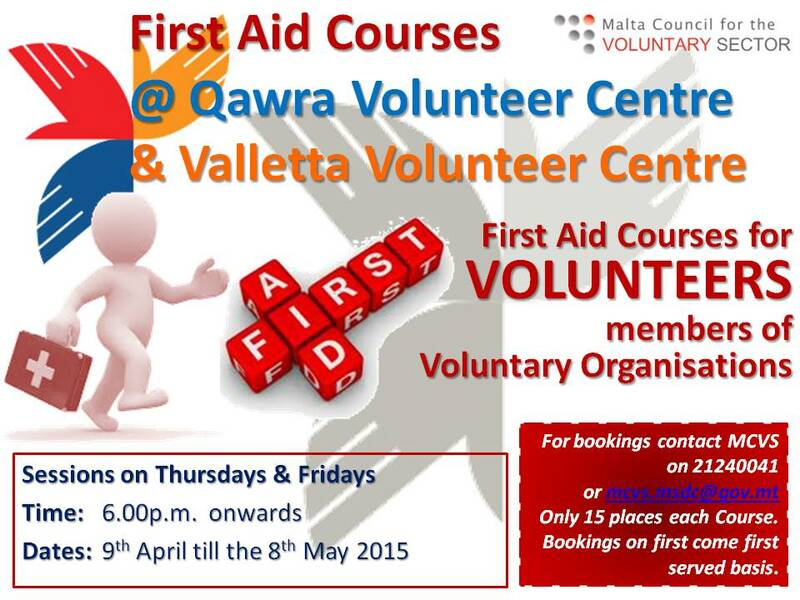 The first course carried out by the Malta Red Cross Society will start on the 9th April 2015 and will be held on four consecutive Thursdays. This course will be carried out in the Qawra Volunteer Centre. The second course will be held on five consecutive Fridays starting on the 10th April 2015 and will be carried out by the St. John Ambulance Brigade. This course will be held at the Valletta Volunteer Centre. To compliment this initiative, the Malta Council for the Voluntary Sector intends to organise another First Aid Course in Gozo, of which details will be published in the coming days. Members of Enrolled VOs may attend these First Aid courses for free. Members of Non-Enrolled VOs will be asked to pay an attendance fee of €15.00 which is still a reduced price to the market value of the courses. Applications for the First Aid courses are to be sent by email to mcvs.msdc@gov.mt. Please note that places are limited for every training session and thus confirmation is done on a first come first served basis. For more information do not hesitate to contact Ms. Christine Camilleri by e-mail on mcvs.msdc@gov.mt or by phone on 21240041.